Surf has developed a robust, smart surveillance solution with cyber security capabilities, that can gather and consolidate video from multiple sources in real time- providing a complete picture of situations in the field. 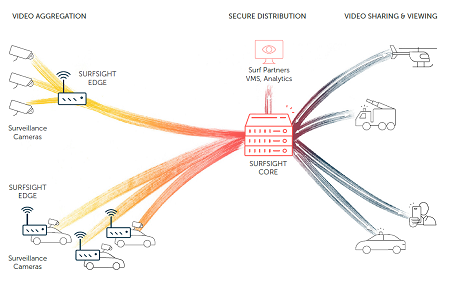 SurfSight connects remote sites with the video surveillance network and provides secure distribution and access capabilities for ad-hoc viewerson any device and on any network. SurfSight is comprised of two main products which may operate independently or together: SurfSight Edge and SurfSight Core. SurfSight Edge aggregates a large number of video feeds from remote sites over limited network bandwidths, while adjusting the video stream to changing network conditions. This ensures optimal and continuous transmission quality, over mobile and unstable wireless networks, in real time (<200 ms latency) while achieving up to a 90% reduction in bandwidth usage. SurfSight Edge features computer vision capabilities that allow for event based detection, including pre-defined face and motion alert parameters for intelligent recording and streaming. SurfSight Core allows secure clientless distribution of multiple video feeds to remote destinations in real time, without exposing access to the surveillance network. It also allows remote viewers to contribute feeds to the network securely from any mobile device.